Tyvabro Guesthouse i Mahebourg, Mauritius: Bestill nå! 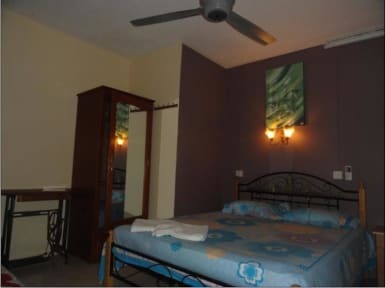 Good Value for money family Guesthouse situated at the heart of a typical Mauritian small town at 7 km from the airport and Blue Bay, one of the most beautiful beaches with its unique marine park. Mahebourg is a small historical town that has kept its Mauritian lifestyle. Tyvabro offers you an enchanting environment, a cozy family atmosphere with a unique welcome from the heart of a Mauritian family hospitality. 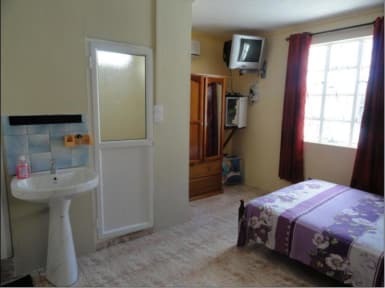 All rooms have individual air conditioning unit, ceiling fan, TV/DVD, electronic safe, Mini-fridge, private shower/WC. A common living room where facilities for making coffee, tea and chocolate drinks is made available freely by Tyvabro. A hearty breakfast with fresh bread and fruits will be served on the terrace facing and overlooking the picturesque view of river La Chaux the seas, the Cavendish Bridge and Lion Mountain.